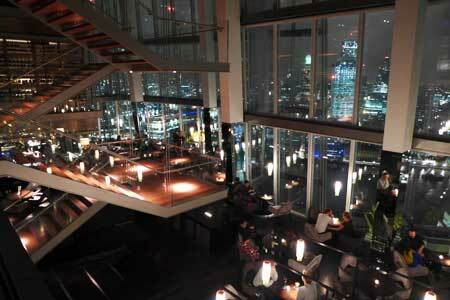 Some of the best views in London and good British cooking. Breakfast, Lunch & Afternoon Tea Mon.-Fri., Dinner nightly, Brunch Sat.-Sun. : Aqua Shard offers views over London from the 31st floor of Europe's highest building, and an interior done in a purple and grey color scheme with comfortable banquettes covered with Liberty print. Add to all this dishes using seasonal local ingredients and a dash of exotic flavors and you have a winner. Potted rabbit comes with baby vegetable pickles and rosemary toast; roast halibut is accompanied by charred onion, confit orange peel and nasturtium leaves with a passion fruit and honey dressing adding a sweet note. Or go for roasted Cornish lamb loin with carrots, mint yogurt and puffed rice. Desserts range from salted caramel chocolate mousse with crispy Mandarin to poached pear with honey sponge and ricotta, and there’s a good selection of British cheeses as well. Breakfast is another British feast; try the full English or go back to your childhood with soft boiled eggs and buttered soldiers. Lunch Mon.-Fri. 2 courses £31, 3 courses £34; 3-course brunch £48; classic afternoon tea £42.